Mare must have negative culture for live cover. Translated, Rom Rye means Gypsy Gentleman. Rye is gentle indeed. He is never mean and never takes unfair advantage as some stallions do. 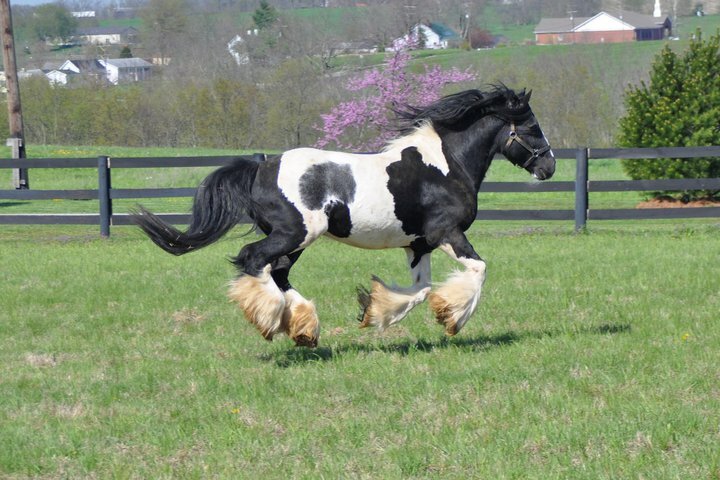 This is a horse you can go out to the field, halter him, and ride him with no saddle or bridle. You can sit on him, stand on him, brush him, bathe him, ride him in the water, take him into your house , he is WONDERFUL! He is broke to both ride and drive. How is he with mares? Confucius said -- "A true gent is friendly but not familiar" this is Rye. He has been blessed with amazing feather and 11 and a half inches of bone, he is a good boy to shoe, clip, trailer, stable, catch, and bath. Rye probably has the best temperament of any stallion I have ever owned. If you would like to know more about him please call me, it would be a pleasure to tell you more about him.